The Incredible Hulk, the movie, is every bit as psychotic as its titular character. It moves from ridiculously overwrought melodrama to geeky, amiable humor. Consider this as a “requel,” a hybrid of a franchise reboot and the standard sequel somewhat along the lines of Superman Returns. The opening credits set the stage, featuring Bruce Banner (Edward Norton, Fight Club) going through that infamous experiment which gave him gamma ray poisoning and a really, really bad temper, the kind that would make a drunk Irish sailor go — yes — green with envy. Picking up a couple years after that fateful incident, the story finds Bruce in Brazil. Going to an overcrowded South American city isn’t the greatest way to chill out and get away from what ails you, but Bruce has taken on a job at a bottling plant to bide his time — and pay his bills — while he makes contacts to help track down a rare flower that should help cure his greenness. From there, Bruce heads back north, through Mexico and on up to Virginia in order to retrieve data about his blood. Concurring with Kermit the Frog’s statement that “it’s not easy being green,” Bruce wants to get rid of the gamma poison before the military hunts him down, slices and dices him, and uses his genes to create a super army of ill-mannered, ill-tempered soldiers who can take a beating and keep on pummeling. That’s the story in a nutshell. Unfortunately, there’s a creeping feeling throughout The Incredible Hulk that it’s a generic story that didn’t have to be told and, if it absolutely, positively did have to be told, it could’ve been done better. Granted, Hulk aficionados will find enough to admire in this second big-screen serving of Hulkamania, but this one lacks the crossover appeal of Spider-Man and Iron Man. There is certainly a healthy dose of respect for the Hulk’s roots. Among those making cameos this time around are Stan Lee, Bill Bixby (via a vintage TV clip), and Lou Ferrigno (doubling up as a security guard and as the voice of the Hulk). If those names don’t mean anything to you, don’t worry about it. Chances are this one’s not for you. There is also one doozy of a cameo at the very end, a slick bit of cross-studio casting that can only be described as “Marvel-ous.” Unfortunately, that cameo also brings with it a painful awareness that there are much better comic book movies out there. There’s no doubt this movie carries a load of “geek cred,” including the use of the exact same camera angle and lighting from the TV show’s opening credits as Bruce’s eyes go green with rage. Throw in references to Nick Fury, Stark Industries, and SHIELD, and it’s a full-blown comic book love-in. That said, the bad outweighs the good. Given a cast plucked from the A/A- list, expectations should be high. 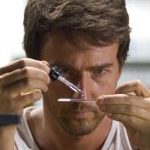 However, Edward Norton is caught in the act of acting. William Hurt (Dark City) as General Ross certainly looks the part of a character ripped right out of the frames of a comic book, but he’s a one-note baddie. Not much more can be said for Liv Tyler (The Lord of the Rings), who is surprisingly bland as Betty Ross, Bruce’s former girlfriend. Even the normally reliable Tim Roth (Dark Water), who goes mainstream this time around as Emil Blonsky, a die-hard soldier, is hard to believe, particularly with his shirt off — and even with his tattoos. The biggest bummer, though, is the computer-generated Hulk himself. For all its lack of realism, this might as well be Song of the South 2. There’s an art to making a movie in which the lead character spends a fair amount of time as nothing more than pixels. Sam Raimi got away with it in Spider-Man because the CGI was limited primarily to creating the illusion of a sprightly, nimble hero swinging his way through the concrete jungle. And Iron Man got away with it because, heck, the guy’s in a suit of iron (or some such derivative). Here, Hulk suffers from the same problems that plagued Peter Jackson’s King Kong. It simply ain’t believable. By the way, while several attempts are made to address the whole “pants issue,” it’s hard to comprehend how any thread would remain on the green meanie when they’re expected to go from Bruce’s roughly 32- or 33- inch waist to a waistline only slightly shy of the aforementioned great ape. Not even Jack Black’s powder-blue “stretchy pants” in Nacho Libre would survive such a stress. Well, if the mind is allowed to contemplate such things, the movie can’t be that good. And when it all winds up with yet another loud, frenetic, empty boss battle of computer-generated behemoths, it’s time for a yawn and a sprint for the exit.